…THE SPRAWLING MEGA-PRISON in the heart of GOTHAM CITY, home of the most violent thugs and infamous villains. With the lives of innocent civilians at stake, only one man can save them and bring justice to the streets: BATMAN. This is a list of VGCollect users who have Batman: Arkham City - Game of the Year Edition in their Collection. 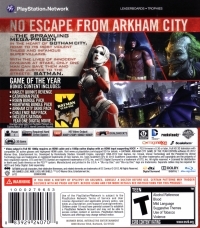 This is a list of VGCollect users who have Batman: Arkham City - Game of the Year Edition in their Sell List. 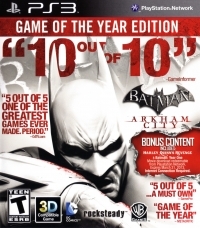 This is a list of VGCollect users who have Batman: Arkham City - Game of the Year Edition in their Wish List.